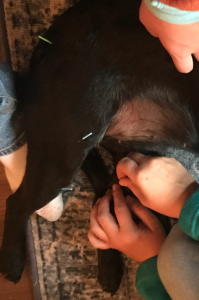 Abstract: A 3 year old female spayed Labrador mix dog presented for acupuncture evaluation and treatment. The dog had her left front limb amputated following a septic wound, from the scapula distally, and the owner was concerned about compensatory muscle soreness as well as possible phantom limb pain. Myofascial examination revealed areas of sensitivity and trigger points through the tricep muscles in the right front (RF) limb, thoracolumbar region and hindlimb musculature, especially in the left hind (LH). Acupuncture was used to treat the compensatory gait mechanisms and anxiety in this dog. Ophie, a 3 year old female spayed Labrador mix dog, presented for acupuncture evaluation and treatment. The owner had rescued the dog from Mississippi one year prior after Ophie had been found abandoned in a parking lot with a septic left front (LF) limb. Due to massive infection and tissue injury, the LF limb was amputated from the scapula distally. Ophie is a very active dog and lives on a farm where she often plays with other dogs. Overall, having three legs does not seem to affect her in any significant way. The owner has noticed that at times Ophie will twitch the muscles where her LF used to be which may or may not be evidence of some phantom limb pain. When Ophie was first adopted, shortly after her LF amputation, she would occasionally fall off the bed in the middle of the night and the owner suspected that she had been dreaming that she still had four limbs and would awaken forgetting that she now only had three. On initial examination, Ophie was bright, alert and responsive. Vital parameters were within normal limits. No abnormalities noted on neurologic examination. Ophie was not sensitive to palpation of the amputated area however did seem to enjoy being gently massaged around there. Myofascial palpation revealed taut bands through the RF triceps muscle. Range of motion in her carpus was decreased. Trigger points were evident in the musculature surrounding her thoracolumbar junction. The musculature of both hind limbs was very developed, and taut bands were present through her quadriceps and gluteal muscles bilaterally. The taut muscles were more evident in her LH limb. Acupuncture points were initially placed with the idea of achieving some anti-anxiety and calming effects, followed by acupuncture points chosen based on her myofascial exam. Based on Ophie’s myofascial examination, she showed sensitivity at BL21 and BL23 around her thoracolumbar junction so those points were used initially. With the taut bands present in the triceps musculature as well as through the quadriceps and gluteal muscles, a mixture of dry needling and massage was used. The goal of Ophie’s acupuncture was to relax any taut musculature and connective tissue, provide relief and improve range of motion in her RF carpus, and have the treatments be calming/relaxing all at the same time. 1) Muscle soreness from compensatory mechanisms for having three legs, specifically through the triceps in the RF and through the abductors and quadriceps in the hind limbs. Muscle soreness (triceps, quadriceps), stress/anxiety, and phantom limb effects but not specifically pain. Ophie was a quite nervous for her acupuncture treatment so with her unknown history we started off fairly conservatively. Treatments were planned once monthly which seemed appropriate for a maintenance type program. Acupuncture points were chosen based on myofascial exam as well as selection of anti-anxiety points. Massage was used with all acupuncture treatments as well. Forelimb points were only performed on RF and back/hindlimb points were performed bilaterally. 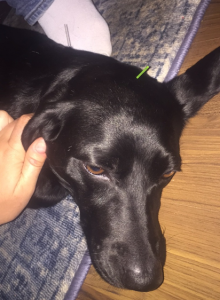 In the future, as Ophie continues to accept and enjoy her acupuncture treatments, she would benefit from some electroacupuncture to aid in muscle relaxation in her RF and LH. Phantom limb pain is a disease that has been difficult to research in animals in the past simply due to the fact that they cannot say when there are strange or painful sensations occurring at the site of amputation and therefore control measures are hard to define. Amputation of a limb can lead to neuropathic pain. In this case, it did not seem that Ophie was suffering from phantom limb pain, although it is possible that at times she feels certain sensations at the site where her LF was, which might explain the muscle twitching. In dogs with limb amputations, acupuncture would certainly be very helpful to manage any neuropathic pain associated with the amputation, as well as the compensatory mechanisms that the body takes on to manage with one less limb. Ophie responded well to her acupuncture treatments, and after realizing how good they made her feel, she allowed herself to become very relaxed during treatments and eventually even appeared to have fallen asleep by the third session. The owner noted that following the acupuncture treatments, Ophie did not feel tired, but instead seemed to have more energy than normal with even more bounce in her step. Acupuncture was helpful in this case with managing compensatory soreness following amputation. Hu, X., Trevelyan, E., Yang, G., Lee, M., Lorenc, A., Liu, J. and Robinson, N. (2014). The effectiveness of acupuncture/TENS for phantom limb syndrome. I: A systematic review of controlled clinical trials. European Journal of Integrative Medicine, 6(3), pp.355-364. Jarvis, S., Worley, D., Hogy, S., Hill, A., Haussler, K. and Reiser, R. (2013). Kinematic and kinetic analysis of dogs during trotting after amputation of a thoracic limb. American Journal of Veterinary Research, 74(9), pp.1155-1163.